One issue we have not examined as we looked at the fabrication of houses in the factory is the foundation work that goes on in advance of the arrival of the house. 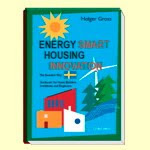 The Swedes are using some innovative products for foundations as well, products that make their status quo houses much more energy efficient than ours here in the States. 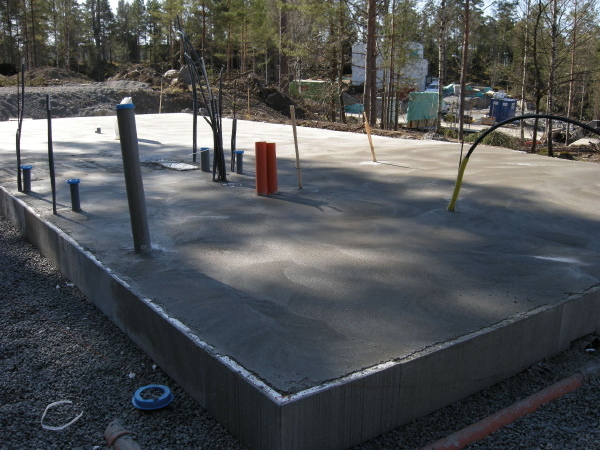 New houses in Sweden are primarily built on slabs, partly because its expedient, but also because its naturally the best way to have in floor radiant heating. In a cold climate this is the only way to use a slab otherwise your slab will feel cold and uncomfortable. But a slab in a cold climate must be insulated from the elements or it will throw heat out its edges. There are typically two strategies to isolate your slab from the cold. The first strategy is to make an insulation break between the slab and the foundation wall. This is typically done with a narrow insulation layer. In order to place this between the slab and wall the two structures have to be built in separate operations. First the wall, insulation break, and then the slab is poured inside the walls. Two steps. The second strategy is to insulate the outside edge of the slab. This allows you to pour the slab and foundation wall in a single step, but you have to return and install insulation around the perimeter. Thats not the end of it though. This insulation is of course very vulnerable to damage. Its a soft material and it is right at grade, so it must be protected by something tough, usually the best choice is a cement board product. The insulation and protection board creates at best a second step. Ok, what are the Swedes doing. First of all they are not building deep foundations. They are building on Frost Protected Shallow Foundations. All buildings in cold climates traditionally are founded on soils below the frost line. How do the Swedes avoid this then. They highly insulate the slab to isolate the underlying earth from freezing air, and in colder climates supplement that with a skirt of insulation around the house perimeter. Furthermore their slabs are insulated at the perimeter which allows the radiant slab heating system to remain in the house. Collectively these elements function to prevent soils below the foundation from freezing and heaving. So suddenly they have eliminated the foundation wall and only need to build the slab on grade. A great savings in time, effort, and expense. Ok, but they still end up with the slab insulation issues described above. No, they do not. They use a foam formwork that forms the perimeter of the slab, and insulates it at the same time. 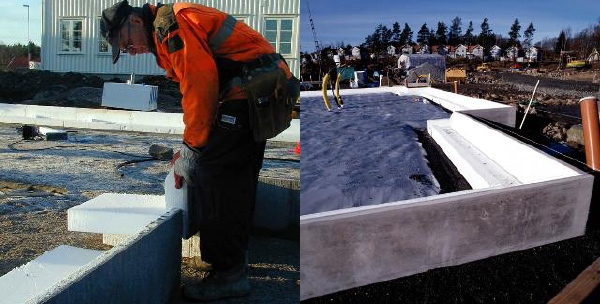 And this foam formwork is coated with a tough cement finish that protects the foam and prevents it from being damaged. And most important of all, it takes just one step. Laying out the slab - corner pieces are place first. Ready for the pour, edge forms, wire mesh, plumbing, and heating loops all in place. The slab poured. Once cured its ready to receive the prefab house. Very cool... but I am wondering how wall loads are handled. It looks like there is no stem wall. Is the slab extra thick to act as a "footing" for the perimeter loads? 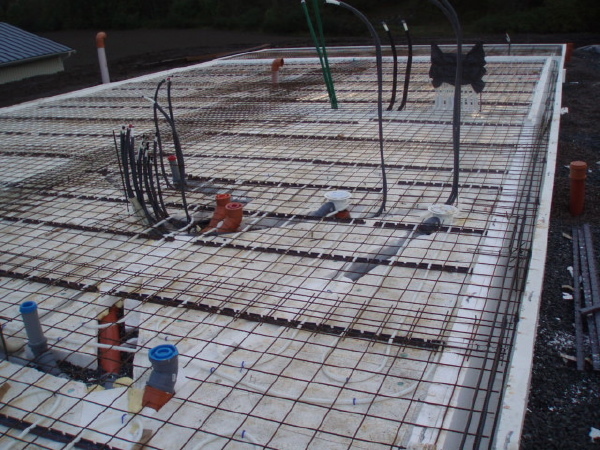 jb, if you look at the photo above with the wire grid and piping all in place, and look at the perimeter you can see that the foam formwork makes a downturned edge all around the slab. At the bottom of this edge you can see they have placed reinforcing bars which makes a grade beam out of this downturned edge, and supports the direct wall loads. They would make a similar depression if there was a load bearing wall inside the house. thanks greg... that's what I started thinking too, but I guess I've never seen foam placed underneath a load bearing element. I was concerned it would get crushed. Or am I still reading it incorrectly? Either way, cool stuff. I don't have a good answer for that jb. They are clearly extending the foam under the slab edge, and I would have the same concern about bearing the house on the foam. But I don't know the density of the foam, or any of the details behind the product. 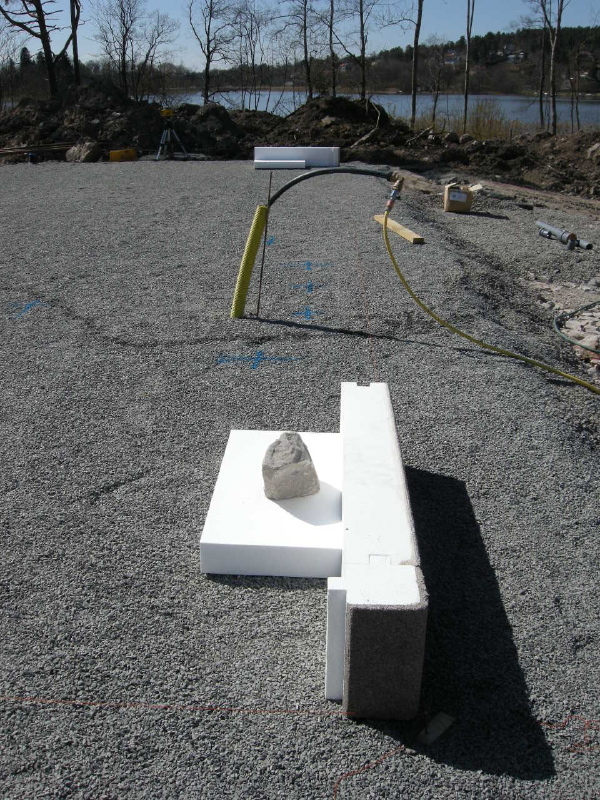 But this is status quo in Sweden, and you can certainly see the energy benefit of floating the slab edge on insulation like this. Check out http://www.legalett.ca/index.htm who is based in Canada and ships their product to the US. They require a stamp from a local engineer to install in the US but their documentation says it is no problem. 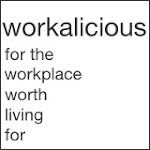 This is a great post, Greg, and I am going to seriously pursue this for our next project in Philly as it could be a big cost and time saver. Thanks! Thanks for that link Chad. I had not had a chance to look for a comparable North American product. They have a video on their site which I will watch to see the details of their formwork.